International Observations of Congo’s Elections: How Representative? GOMA, Democratic Republic of Congo — First assessments by the three major international observer missions of Congo’s presidential and legislative elections have come out, as the country awaits the official results, expected late tomorrow. An important question to ask: Did the elections observers have enough personnel on the ground to accurately assess how freely and fairly people were able to cast their votes? The European Union, or E.U., had 147 short- and long-term observers in the country on Election Day last Monday. They were sent out in 71 teams to 35 urban and rural areas. In the 2006 presidential elections, the E.U. sent twice as many. Asked why the E.U. halved its mission for this election—only the country’s second since independence—a spokesperson of the E.U. observation mission told Enough: “Budgetary control is the reason for the difference between 147 and 300 observers in 2006.” In a preliminary report, they called the elections generally calm besides some serious acts of violence and various irregularities. The Southern African Development Community, or SADC, which had around 250 observers in the country, declared they were satisfied with the conduct of the elections. They have not yet provided the number of polling stations visited. The Carter Center’s 70 observers visited 300 polling sites in Congo’s 11 provinces and noted that 49 percent were marred with minor problems and 16 percent were poorly disorganized. They concluded the elections went well overall. Given the size of the Congo—nearly equal in size to Western Europe—and the official count of 63,865 polling stations nationwide, it is questionable how an assessment by a few hundreds observers will be a true representation of how fair and free the elections went. Reports that the E.U. also avoided some parts of the country such as most of North Kivu’s Masisi and Walikale territories out of logistical and security reasons further undermine a representative assessment of the country as a whole. Enough’s field research on Election Day found that the elections went relatively smooth in major towns such as Goma and Bukavu, while remote areas with no presence of international or national observers saw serious irregularities and incidents of violence as well. In Masisi territory, for instance, Enough reported on logistical problems, fraud, and violence, which deprived people of their right to vote. Religious groups and various NGOs supplied tens of thousands of national observers as well. However, they were also largely absent from remote and unsecured areas—the very areas that should be figured into any overall assessment of the elections—and they lacked sufficient financial resources. The Catholic Church, for example, sent out around 30,000 observers, but only received feedback from around 6,000 who were in possession of communication equipments. 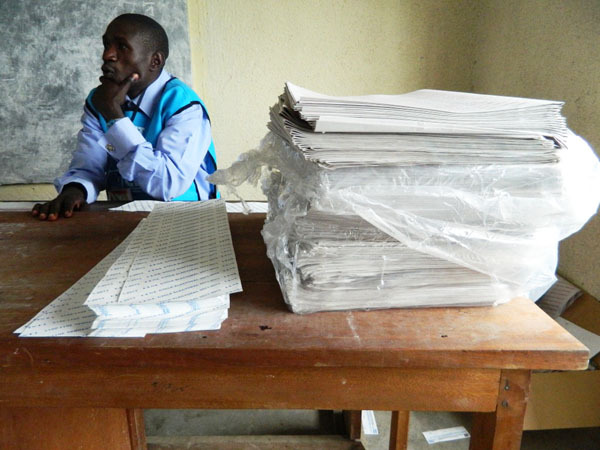 Mostly due to financial and logistical restraints, not all of Congo’s electoral districts had political party witnesses either. In Bas-Congo, for example, CENI voiced its frustration that not a single political party or independent candidate had requested accreditation to observe the election, likely because political parties did not have the resources to send witnesses. In spite of these many limitations, the final reports by the various observation missions will, combined, provide useful documentation of credible grievances. However, regardless of these official assessments, the true test of the country’s post-election stability will come over this next week when results are announced and the presidential and legislative contenders react. Various opposition parties, including the UDPS of Tshisekedi, have already rejected the partial results that have been made public over the last couple of days. According to those figures, incumbent President Kabila is poised to win, with Tshisekedi coming in second. Due to the uncertainty over whether Kabila and Tshisekedi will accept defeat, concerns about post-election violence are growing. Some areas in particular are ripe for violence: Kinshasa, where Tshisekedi is expected to prevail with a large margin based on the published partial results; Kabila’s father’s home province and stronghold Katanga, where ethnic distrust of Kasaïans run deep; and Kasaï-Oriental, from where Tshisekedi hails. Acknowledging the possibility of credible allegations of fraud, E.U. Representative in Congo, Ambassador Richard Zink, for one, took a different tack, urging candidates to abide by the Electoral Code of Conduct and to resort to legal means for electoral disputes that arise. Fidel Bafilemba contributed to this post.